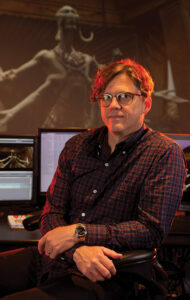 Editor Eric Zumbrunnen, A.C.E., first became known for cutting music videos, like Spike Jonze’s award-winning clip for Weezer’s “Buddy Holly” and Björk’s “It’s Oh So Quiet.” He won the ACE Eddie Award and was BAFTA-nominated for Jonze’s Being John Malkovich (1999), and continued to work with the iconoclastic director on Adaptation. (2003), for which he received a second Eddie nomination, as well as Where the Wild Things Are (2009). His latest film is John Carter, a 3D, special-effects spectacular from Walt Disney Pictures that opens March 9. Based on A Princess of Mars, a 1912 novel by Edgar Rice Burroughs (creator of Tarzan) that debuted the namesake protagonist, John Carter is about the title character, a seemingly immortal former Confederate soldier who mysteriously materializes on the planet Barsoom (Mars) and becomes a hero, the planet’s gravity having given him heightened strength and agility. Starting with A Princess of Mars, Burroughs wrote 11 novels about the Red Planet before his death in 1950, most of them featuring Carter. The film is written and directed by Andrew Stanton, one of the founding members of Pixar who was nominated for Academy Awards for co-writing Toy Story (1995), Toy Story 3 (2010), Finding Nemo (2003) and WALL-E (2008), and also directed the latter two, both of which won the Oscar for Best Animated Film. John Carter is also Stanton’s first live-action film; Pixar is not involved in the project. 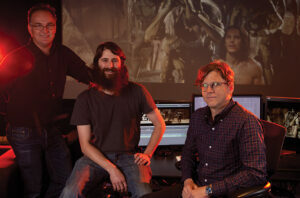 Zumbrunnen, along with his first assistant editor, Erik Jessen, spoke with CineMontage to discuss their work in bringing the legend of John Carter to life. 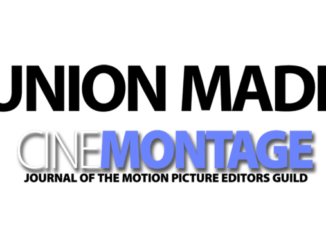 CineMontage: What is Andrew Stanton like to work for as a director? Eric Zumbrunnen: Andrew is an incredibly talented and passionate filmmaker. He’s also one of the nicest people you could hope to work with. He comes in thoroughly prepared and always has a very clear vision of what he wants to achieve. But that’s mixed with a willingness to throw anything out if it isn’t working and start fresh. I felt welcome as a collaborator from the first day. He’s considerate of everyone’s time and works incredibly hard to get the best film possible. 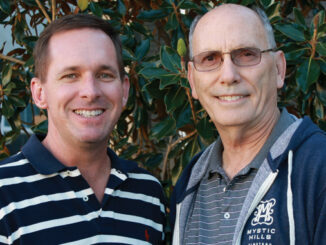 Erik Jessen: With Andrew, it’s a true collaborative effort. As an assistant, I feel I can really talk to him, and that he’ll take it to heart and consider it. That’s not always the case with directors. EZ: Andrew has loved this story since he was a kid, from reading comics based on the books. He has said he’s always wanted to make this film. People have been talking about making a movie about John Carter for 80 years. CM: That’s right. They include animator Bob Clampett in the 1930s, Ray Harryhausen in the 1950s, John McTiernan in the 1980s and, more recently, Robert Rodriguez. EZ: Erik was at Paramount when Kerry Conran was going to direct it. EJ: A lot of concept art was done. We shot some animation tests with motion capture and put together a seven-minute reel. I think they couldn’t get the script working, and didn’t want to spend more than 100 million on it. Jon Favreau came on, but ultimately Paramount wanted to put its money into Star Trek instead. Editor Eric Zumbrunnen, right, with first assistant editor Erik Jessen, left, and assistant editor Jeff Stone. CM: Disney seems a natural home for a film with so many CGI characters, a film that would have been unthinkable in the 1990s. EZ: We have three main characters and two supporting characters who are completely animated. Certainly the technology available today makes it much more possible to give the digital characters the nuance required. Andrew is one of the great animation directors, and he’s really the perfect director for this. EJ: This isn’t a completely virtual world like Avatar. Andrew used old-school anamorphic 35mm film, and shot very realistic footage out in the Utah desert that the creatures could be added to. It has a great feel because of that; very natural and classic — like Lawrence of Arabia almost. EZ: Andrew wanted to touch as little of the frame as possible and do as much as he could on location. CM: How were those creatures created? EZ: The voice actors were always on set acting in the scenes. The creatures they play are eight to ten feet tall, so they were on stilts, apple boxes or platforms. Other times they were walking around with a backpack with a resin cast of the character’s head on a pole to give the proper eyeline. Those were the performances we cut with. EJ: Taylor Kitsch’s [John Carter] physicality is incredible. He’s half actor, half athlete. He was great at miming and reacting to nothing, so you’d think the creatures were really tugging him back and forth and throwing him around. EZ: The actors playing the Tharks had tracking markers painted on their faces, and wore head-cam rigs capturing the performance on two small video cameras. These couldn’t record at 24 fps progressive, only NTSC, but the visual effects people wanted these to be perfectly in sync with the film, so we actually ran the film cameras at 23.976 fps instead of 24. Our Final Cut Pro sequences were set at 23.976. I’m told this is the first Disney film to be cut on Final Cut Pro, version 7. CM: Are you a fan of working with Final Cut? EZ: We cut Where the Wild Things Are in FCP and I wanted to keep going with that. Our assistants had to group the multiple cameras, the audio and the head-cam material so we would have access to all of that in the timeline. Collating all that data was cumbersome, but because our team was so thorough, the technology didn’t get in the way of the work. That’s not necessarily because of FCP; that’s due to having a great team of assistants and a fantastic visual effects editor. EJ: We had about 16 terabytes of data using AJA KONA. We were also lucky to have a producer who was very experienced in post. We always had enough assistants to load all the footage and check everything. So the back half of post went smoothly, I think. CM: How has the character of John Carter, who first appeared in print in 1912, translated to today? EZ: Andrew and co-writers Mark Andrews and Michael Chabon have retained the essence of the character, but gave him a little more back story, more of an arc, and made him a little more human, more complicated. The book was certainly of its time, but it has a timeless appeal. It’s a story of a man who ends up lost on another planet, embroiled in a civil war. In the process of trying to find his way back home, he finds himself. It’s a journey of self-discovery, full of romance and action, and one that anyone can connect with. That’s the timeless aspect of it but, combined with what you can put on screen with today’s technology, it becomes very realistic, believable and visceral. CM: How did you get started as an editor? EZ: I’ve always loved film, but never intended to get into editing or filmmaking. I graduated college with a journalism degree. I needed a job, and spent a long weekend building shelves at an online post facility. They offered me a runner job, which was interesting; then I became a tape operator, then started editing music videos. I got some calls from producers about working with Spike, but I was never available. It was early in his career. A director, Tamara Davis, asked me, “Have you met my friend, Spike? I think you would like him.” We hit it off and pretty much worked together on everything ever since. When he moved into commercials and subsequently features, so did I.
CM: What about his first feature, Being John Malkovich? EZ: For Being John Malkovich, Spike got to use the crew he had always used: the same DP, production designer, costume designer, producer and me. He’s a great collaborator. I’ll say whatever I think, and he’s always willing to listen to and consider the idea. Andrew is the same way. He comes from an animation background and Spike comes from a photography background — but they do have similar qualities. They’re very smart, very talented, very driven. EJ: They’re guys you don’t mind spending 12 hours a day with, or more. CM: I’ve heard that Spike shot Where the Wild Things Are in a very messy way, throwing leaves around and not worrying whether the shots were clean and stable for the effects artists. I’m assuming Andrew shoots much cleaner? EZ: For Wild Things, we were in a tangled forest full of trees, leaves and branches much of the time. John Carter takes place in a sparse, arid, desert landscape, so it’s hard to compare. That said, there was plenty of dust and dirt flying around. We cut for performance. If a take’s going to be difficult for the effects people because they have to rotoscope something out, then it’s gonna be difficult. Andrew wouldn’t sacrifice performance to make it easier on the visual effects people. CM: Is it difficult editing an effects film, where so much material starts off unfinished? characters will look completely different. You’re cutting performances, trying to tell a story, knowing that big empty frame is going to be filled with hundreds of creatures or buildings or ships or gunfire. We used sound and rough drawings to fill in the gaps. CM: How does that work exactly? EZ: We’d do a cut of the actors’ performances, then Andrew or another artist would come in and draw key poses of the digital characters to get an idea of what they’d look like. That would inform the cut and allow people to have a better sense of what the finished film would look like. As we locked sequences, animation would deliver blocking footage — rough poses of the characters in 3D, but not lit or finished. We’d work with those, replacing them with increasingly detailed animation shots, refining the cut until the animation was locked, up until the final renders. There were a lot of gradual iterations, starting from very unfinished material. 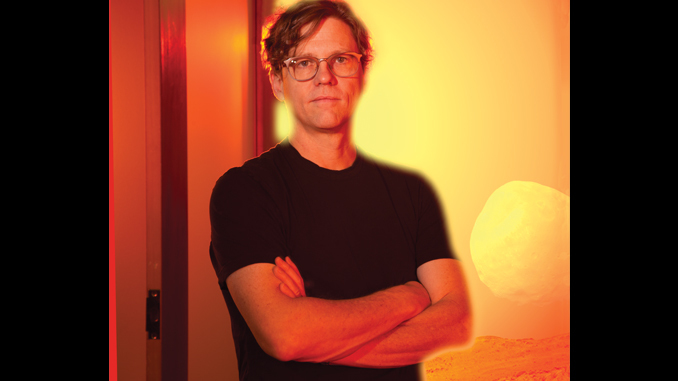 EJ: Andrew was a part of the invention of that organism that is Pixar, almost from day one. It’s been interesting watching him realize how inefficient the process of live- action filmmaking can be. I think he wanted to have it all planned, know exactly what was going to happen all the time. If we do a sequel, I’m curious to see how he’ll change his style. CM: Was it a difficult shoot with Andrew working in live action for the first time? EZ: It was hard, because filmmaking’s hard, but I think shooting live action turned out to be not nearly as different as he thought it would be. As Andrew has said, in animation, nothing comes for free. Every little detail you see in a frame has to be created and approved. The director of an animated film is probably making a lot more decisions every day than the director of a live-action film. In an animated film, you start with storyboards, record scratch dialogue and keep refining the story over many months, long before you see any rough animation. In effect, you make the movie before you shoot it. For John Carter, Andrew didn’t want to do that. 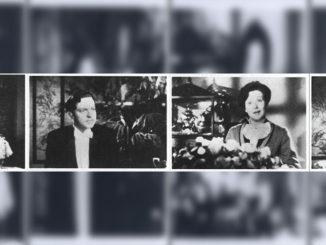 He wanted to have some spontaneity and freedom with the actors, and benefit from those happy accidents you get during a live-action shoot. The one area that he did do more detailed planning for was our major action sequences. He did previz for these five sequences and built a reel. He wanted to know that they worked ahead of time, and have a plan — even if everything else went wrong. He’s a cinephile; he knows his classic films, his classic TV, comedies and animation. When it comes to film, he’s usually the smartest guy in the room by far. CM: What is most important to you as an editor? EZ: Ultimately, I’m trying to help make a film I’d like to go see. I want to tell a compelling story. You’re showcasing the character’s arc and performance while maintaining the action and pacing of the sequences and the shape of the plot. You find a balance. In a film of the scope, scale and spectacle of John Carter, making sure you still care about the characters and that the emotional component doesn’t get overwhelmed by the action is hugely important. Like any movie, you start a little long and work down to your fighting weight. I guess for me, it always boils down to performance. It’s not that I don’t love beautiful visuals. I’ve been very fortunate to work on films where the photography was always excellent. Shot composition, lighting and pacing matter tremendously. But if it’s not in the performance, you don’t feel it, and you’re not going to be invested in the film. 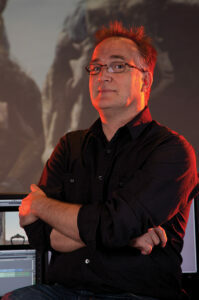 Garrett Gilchrist is a director, screenwriter and editor. He has been contributing to Editors Guild Magazine and CineMontage since 2008. Contact him via his website, orangecow.org.